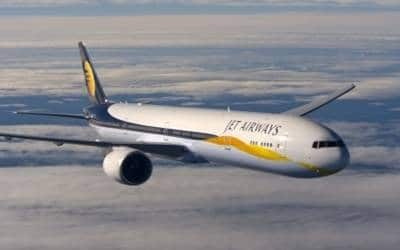 Mumbai, April 9 (IANS) Brokerage firm Edelweiss on Tuesday downgraded the Jet Airways stock from from ‘hold’ to ‘reduce’ owing to the mounting risk on the financially troubled airline. "We continue to assume a swerve back to profit during FY21E and a fair EV/EBITDAR of 7x. But given mounting risk, we are cutting the TP by 22 per cent to Rs 177 and downgrading the stock from ‘HOLD’ to ‘REDUCE’," Edelweiss said. "We believe JAL’s (Jet Airways) EBITDAR shall witness a sharper contraction due to operating leverage; it would, therefore, record another quarter of losses exceeding Rs 10 billion." The brokerage said: "While varying possibilities are emerging, including the hunt for a new buyer and a debt write-off, Jet’s viability has taken a hit."